Hilton Head Magazines: CH2/CB2: Get Off the Couch! “You can diagnose a problem, fine. You can treat the problem, fine. That makes a good doctor. What makes the best doctor is when you can prevent it from even happening. There’s nothing better,” said Dr. Gaston Perez. 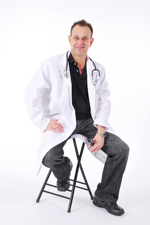 As a primary care physician, prevention is what he is all about. “The best medicine is prevention,” he said. But Perez believes prevention is a two-way street. “Part of prevention is motivating the patient. They have to do it themselves. If they aren’t compliant, all bets are off. However, you have to make it easy for them to take it (treatment). And then there’s the money. If it’s expensive for them, they’re not going to do it. So you’re going to have to find out where they stand. To make prevention work, all of that has to be in the mix. If one thing is out of that formula, then there’s no prevention. The biggest problem we have in health care today is compliance. Prevention won’t work unless the patient wants to do it,” Perez explained. Perez sees patients of all ages: children, teens, their parents and grandparents. But when he opened his clinic, Global Family Medicine, five years ago, he looked at the main health problems people face today—problems that are preventable. “I looked into the main things that kill people. That’s basically heart attacks and strokes,” Perez said. “These are not necessarily the most common medical problems, but ultimately the things that cause heart attacks and strokes are the three things I see the most here: high cholesterol, high blood pressure and diabetes. So it all ties in,” he explained. Among other weapons Perez has in his arsenal to repair and prevent harm from those conditions, he relies on two tests that are truly state of the art and new to the Lowcountry. For cholesterol, he uses what is known as the Berkeley Test. “It’s the most advanced cholesterol test in the world. They actually genotype you. You have seven bad ‘cholesterols.’ Four will kill you and the three others are so worthless they are not going to do anything to you,” Perez explained. In the Berkeley test, the total cholesterol number is less important than the particle size of the HDL and LDL cholesterol and percentages of each, as well as genetic markers that are indicators of potential coronary artery disease. “If we catch it (plaque) early, we can reverse the process. We can do things about it now, like putting you on high dose satins, which we know in evidence-based medicine are proven drugs to reverse the process and prevent huge amounts of problems,” Perez said. Another tool Perez uses is the MET-TEST. It is a cardiopulmonary exercise test (CPET) that assesses how well the heart, lungs, and muscles are working individually, and how these systems are working in unison. Unlike traditional stress tests, where a treadmill is used, the MET-TEST is done on a bicycle. “It’s the most sensitive test for congestive heart failure. The highest cost to Medicare is congestive heart failure. It’s not because of heart attacks. It’s because of uncontrolled high blood pressure. Congestive heart failure is basically separated into two types. One, called systolic, is where the heart muscle is just weak. You get that because you get heart attacks. But that makes up only 5-7 percent of the people who have congestive heart failure. “The biggie, the one that really is a problem, is called diastolic dysfunction. The heart muscle, if anything, is strong and thick. It’s built up. What happens is you get a stiff heart. So when it tries to fill up with blood, it can’t. It’s stiff. When it tries to relax, it can’t. It’s stiff. So the blood starts backing up. That’s purely from uncontrolled hypertension. When you do the MET-TEST, because you’re exercising the heart at the same time, you can actually see that. “You can see blockages at the microscopic level. There’s lack of blood going to the heart. You’re actually seeing it. Basically, the left ventricle—the bottom part of the heart—is just acting freaky when it starts asking for blood. What we see in the MET-TEST is a decrease in the output,” Perez explained. The test allows him to take preventive measures well before any symptoms occur. For diabetics, Perez said that he treats them like they’ve already had a heart attack. “If you’re diabetic, you’re already going to go on cholesterol and blood pressure drugs—drugs to cover three systems. If you treat a person as if they already had a heart attack, even though they haven’t had one, they won’t have a heart attack. A diabetic is at a super high risk for heart attack. All these people are going to need blood pressure pills, cholesterol pills, and pills to control their sugar,” Perez said.